9 − = 5 Required Please enter the correct value. It was an ugly October for investors. Major indexes lost about 10% over the course of the month. And some big-name tech stocks, such as Amazon.com Inc. (NASDAQ: AMZN), got hit even harder. 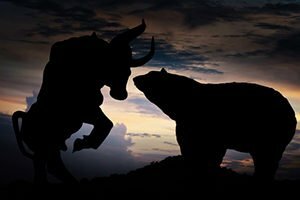 In the wake of the carnage, it might be time to reallocate your portfolio – especially if some of your holdings hit their trailing stops along the way. Or, if you've been waiting on the sidelines for the right time to buy, now's your opportunity. So we've got a selection of investments with an eye toward building – or re­-building – your portfolio, uncovering blind spots you might have had before the sell-off, and tapping into the most unshakeable industries of the future. We'll start out with not one, not two, but three picks that will ground your portfolio in the most important tech trends of this generation. A company known for making video game graphics cards is now at the forefront of the self-driving vehicle revolution. Another cannabis grower has graduated to the New York Stock Exchange and could be the rocket stock that carries your whole portfolio. It's been 95 straight months of job growth in the United States, and one tech company is turning that into big gains for its investors. You've been hearing about the "FANG" stocks for years, but now it's time to get acquainted with a new group of giant tech stocks that are generating loads of cash. Of course, we love buying individual stocks, but exchange-traded funds can be a great way to begin rebuilding your portfolio. Gaining broad exposure to a major growth sector gives you a solid foundation to build on. And if you did already own any ETFs, now is a great time to fill in those gaps. So today we've got three tech-oriented ETFs that Money Morning Defense and Tech Specialist Michael Robinson says are great for building wealth. iShares North American Tech ETF (NYSE: IGM) gives you nearly 300 of the top U.S. tech stocks in a package that costs less than $200 per share. 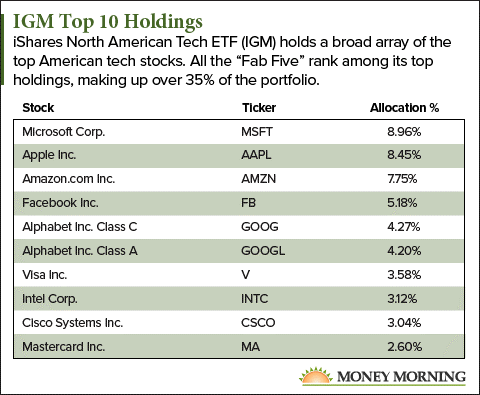 That includes all the "Fab Five" tech stocks, which are each weighted between 5 and 9% of the total portfolio. Plus, it includes stocks that represent every aspect of the tech world: cybersecurity, self-driving cars, digital entertainment, hardware manufacturing, the Internet of Things (IoT), mobile apps, and more. No doubt you'll want to bolster this ETF by picking a few of your favorite tech companies. But IGM is a great way to cover all your bases when it comes to profiting off American tech. From there, you'll want to identify some of the most profitable tech niches. That's where an ETF like First Trust Cloud Computing ETF (NYSE: SKYY) is a great opportunity. The days of storing information on local hardware are rapidly disappearing. Cloud computing offers efficiency, security, and accessibility in our increasingly mobile world. And at less than $60 per share, SKYY gives you 29 of the most important players in the industry. That includes previous "Best Stocks to Buy" picks like Intuit Inc. (NASDAQ: INTU) and Adobe Systems Inc. (NASDAQ: ADBE), as well as leading cloud providers like Amazon and NetApp Inc. (NASDAQ: NTAP). Since SKYY is strictly focused on holding cloud companies, it's an ETF that lets you narrow down exactly what subsector you want to invest in, without having to pick individual companies. As cloud computing becomes the standard for every single organization and individual on the planet, this is an ETF that is sure to deliver solid gains year after year. But the sector that's being most profoundly changed by tech might be medicine, and particularly medical devices. That's only going to be more important as an aging demographic puts more demand on the healthcare system. Innovation in medical devices lets the industry serve more patients more effectively at a lower cost. The United States accounts for 40% of the global medical device market, which makes iShares U.S. Medical Devices ETF (NYSE: IHI) an ideal way to play this lucrative sector. Among the roughly 60 picks in IHI's portfolio are Money Morning favorites like Becton Dickinson & Co. (NYSE: BDX) and Abiomed Inc. (NASDAQ: ABMD). It also includes heavy hitters like Abbott Laboratories (NYSE: ABT), Boston Scientific Corp. (NYSE: BSX), and Baxter International Inc. (NYSE: BAX). If these three ETFs were the only investments you owned, you'd be well on your way to building a well-rounded, profitable portfolio. You can use these as a starting point or to add a stronger foundation to your existing investments. Another tech sector that will deliver supercharged growth over the next decade is self-driving vehicles. According to Allied Market Research, autonomous vehicles will be a $54.2 billion market in 2019. By 2026, it will be more than 10 times that. We've got a great pick in this red-hot market. But it's not an auto company.